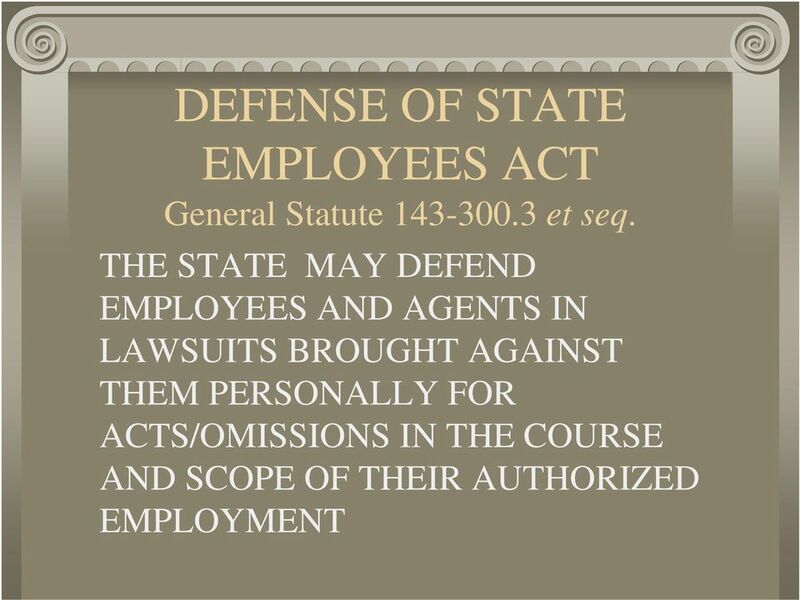 Download "Defense of State Employees: LIABILITY AND LAWSUITS. 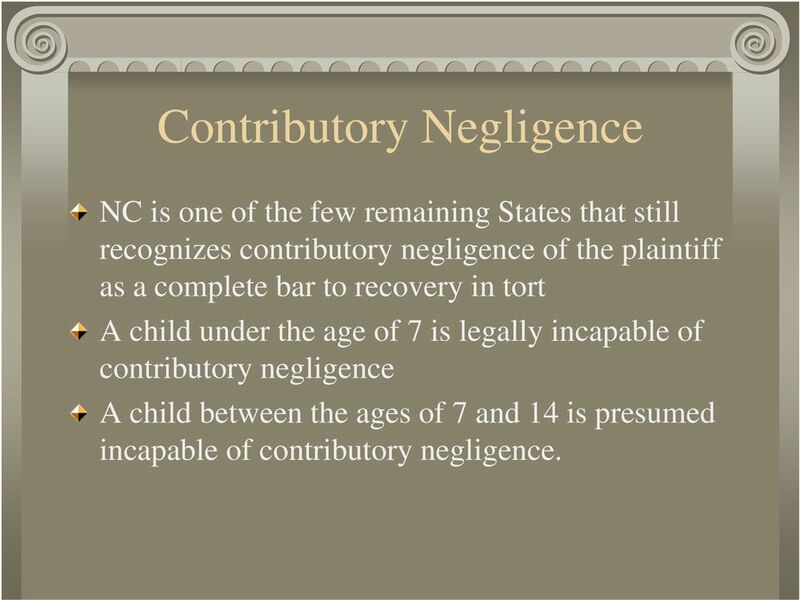 UNCW Office of General Counsel January 2010"
7 Contributory Negligence NC is one of the few remaining States that still recognizes contributory negligence of the plaintiff as a complete bar to recovery in tort A child under the age of 7 is legally incapable of contributory negligence A child between the ages of 7 and 14 is presumed incapable of contributory negligence. 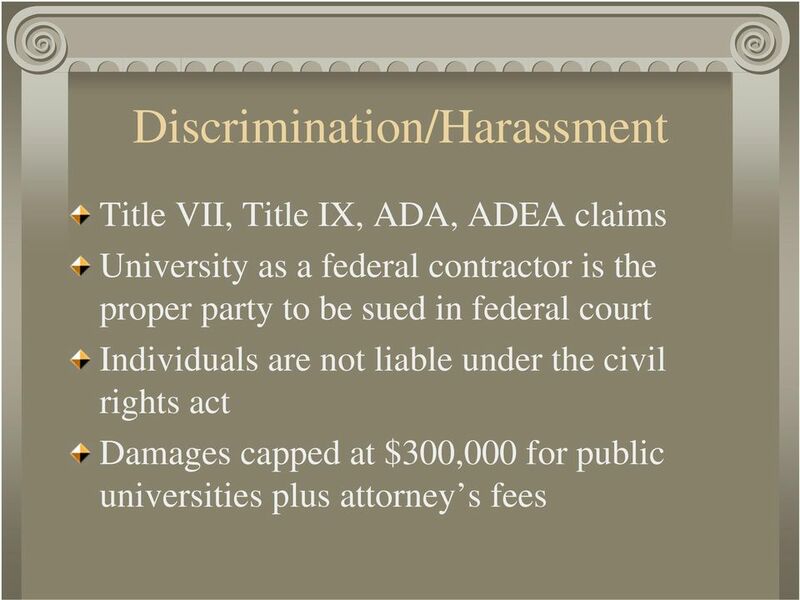 11 BREACH OF CONTRACT Contracting party alleges that university did not meet obligations under contract Must have authority to sign contract; otherwise state employee may be personally liable for the breach Damages are typically for actual damages; not consequential or liquidated. 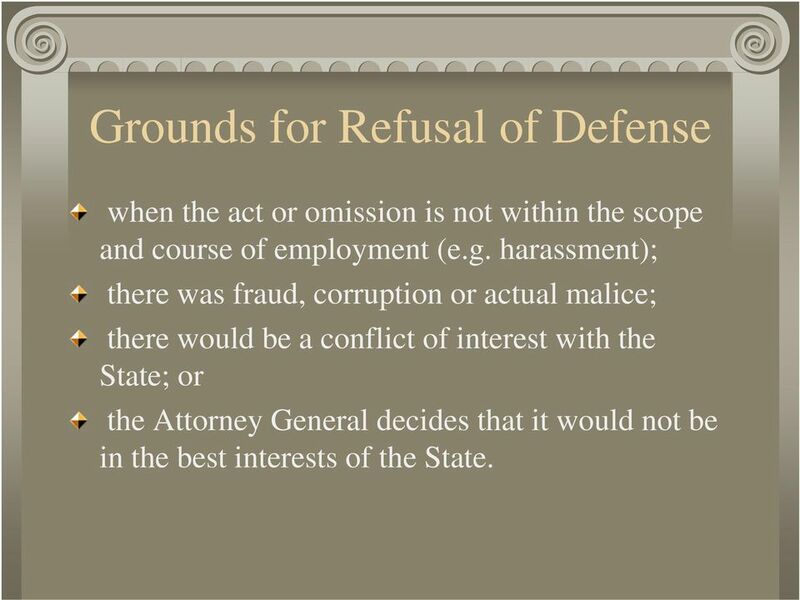 17 Grounds for Refusal of Defense when the act or omission is not within the scope and course of employment (e.g. 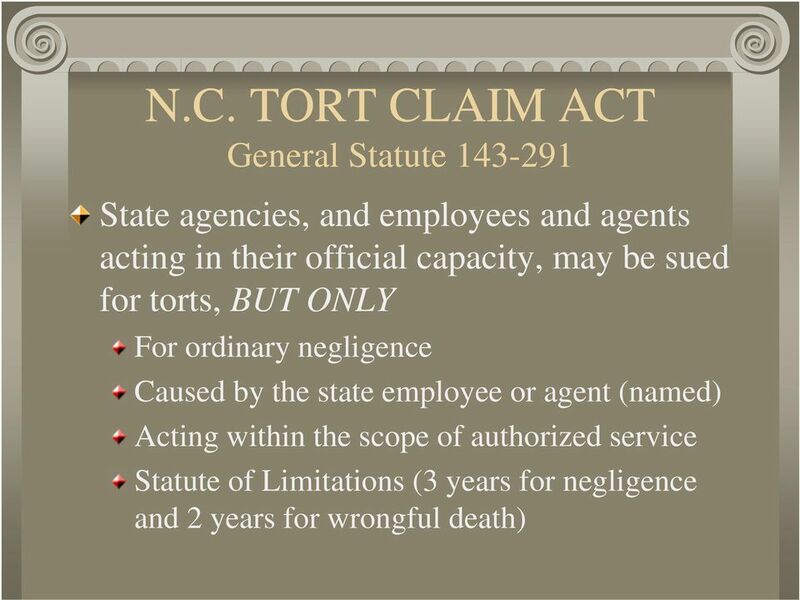 harassment); there was fraud, corruption or actual malice; there would be a conflict of interest with the State; or the Attorney General decides that it would not be in the best interests of the State. 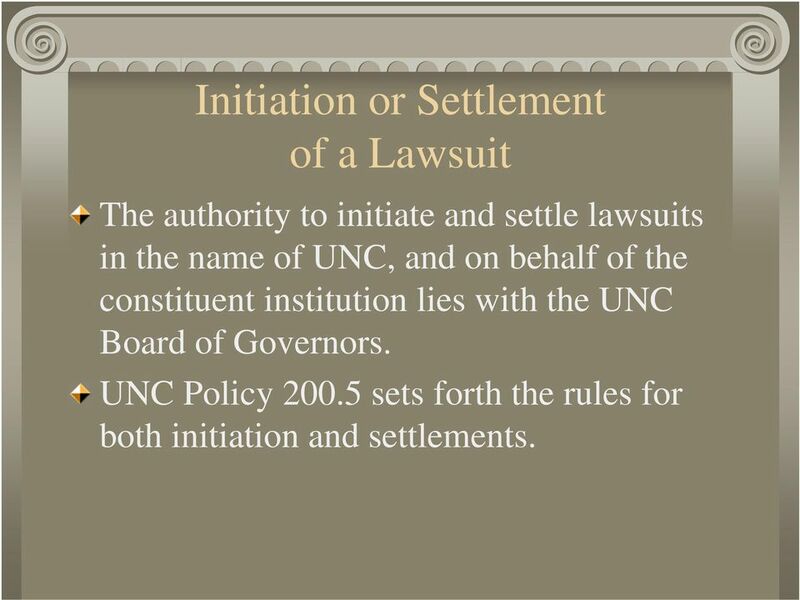 19 Initiation or Settlement of a Lawsuit The authority to initiate and settle lawsuits in the name of UNC, and on behalf of the constituent institution lies with the UNC Board of Governors. 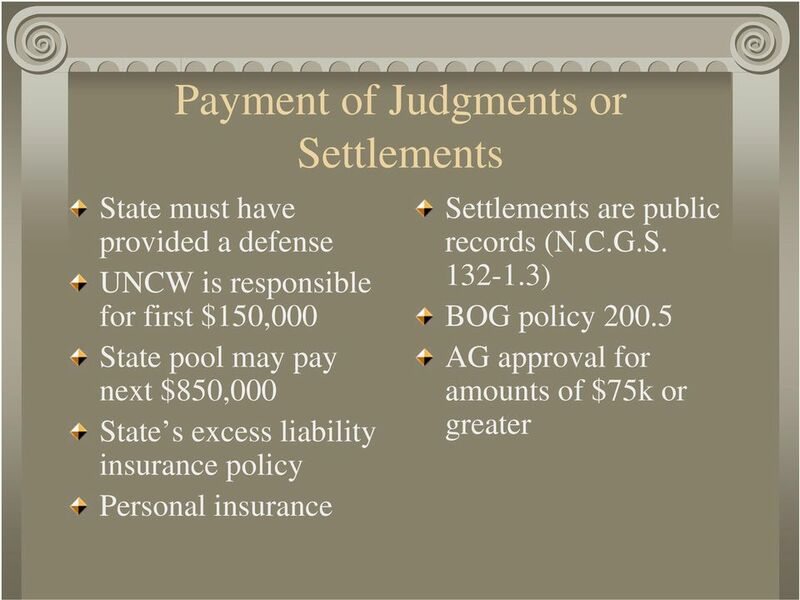 UNC Policy sets forth the rules for both initiation and settlements. Chapter 4 Crimes (Review) On a separate sheet of paper, write down the answer to the following Q s; if you do not know the answer, write down the Q. 1. What is a crime? 2. There are elements of a crime. 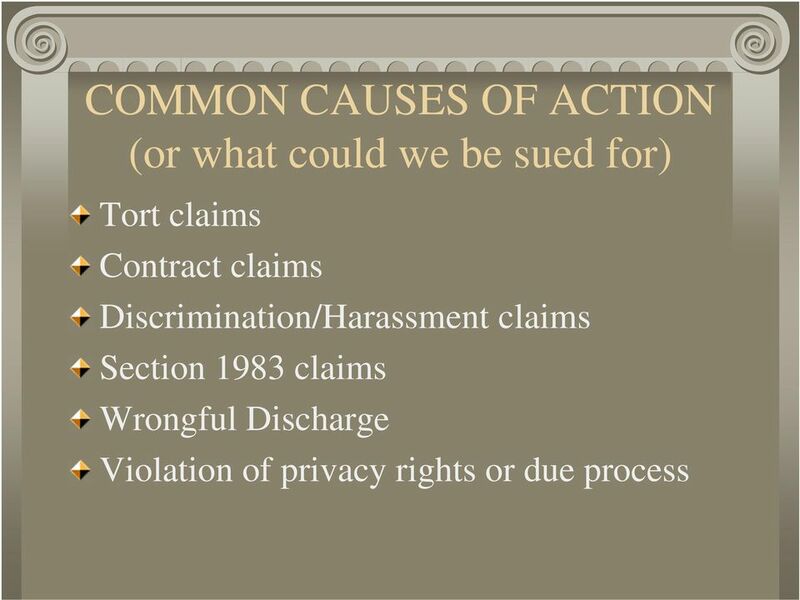 Why Obtain Student Medical Malpractice Insurance? a. 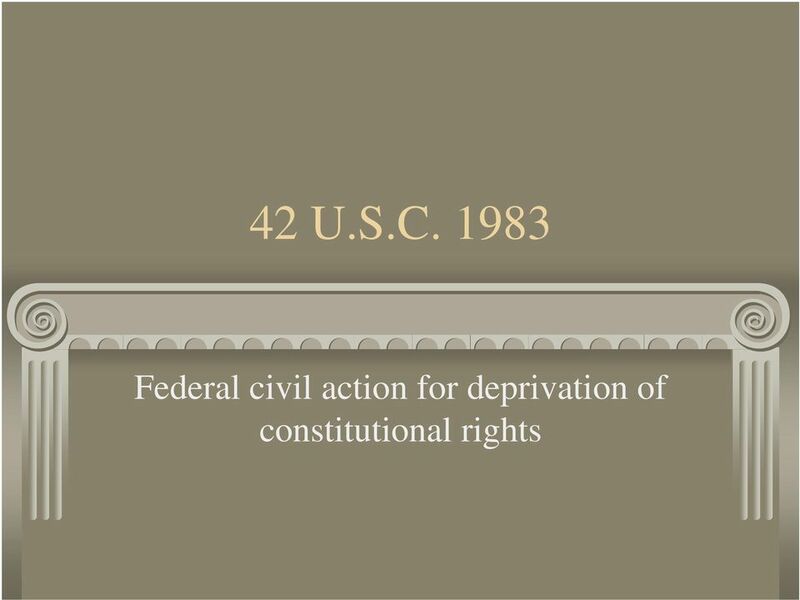 Employees of the Department of Human Services in their individual capacity at the time of an occurrence covered hereinafter. 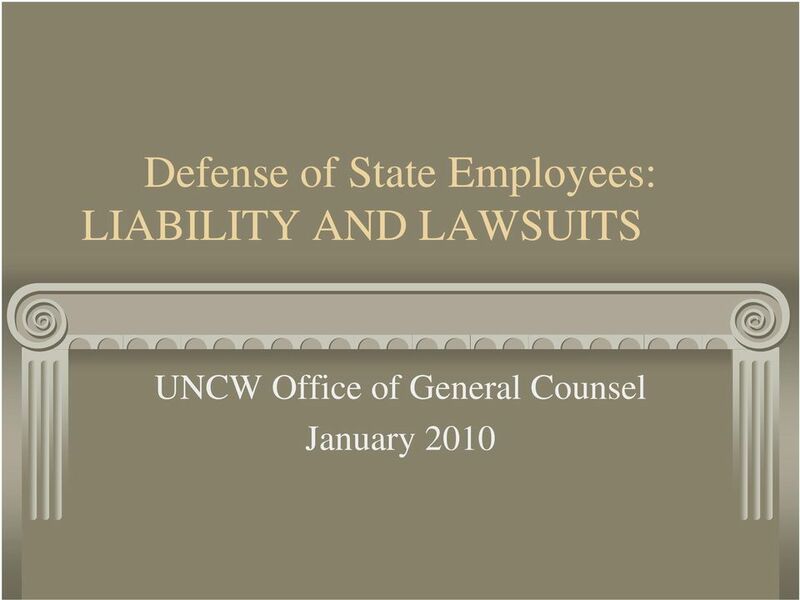 Not-for-Profit Directors and Officers Liability Insurance. Presented by: W. Anderson Baker, III, CPCU, ARM GILLIS, ELLIS & Baker, Inc. MEMORANDUM. 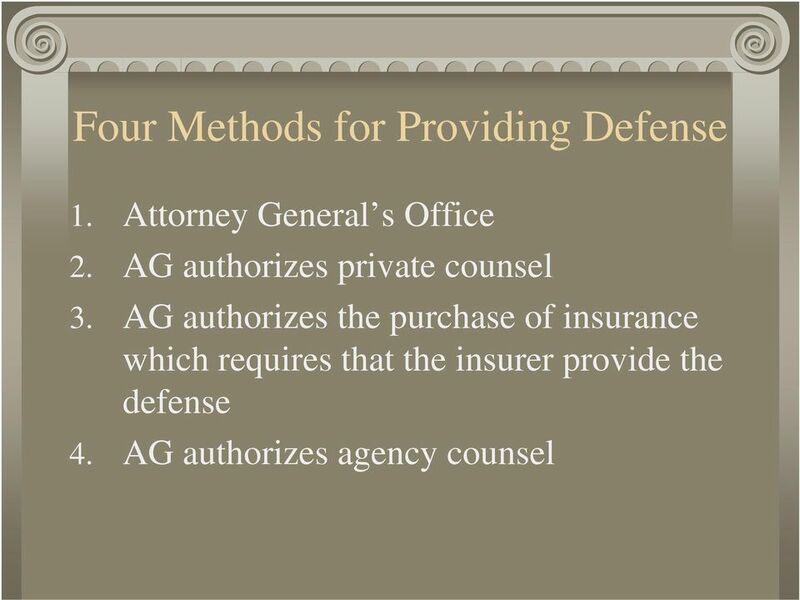 Receive and file presentation on fiduciary insurance and/or provide follow-up direction to staff. APPENDIX B. Adult Check here if the intern is an adult. Minor Check here if the intern is a minor. 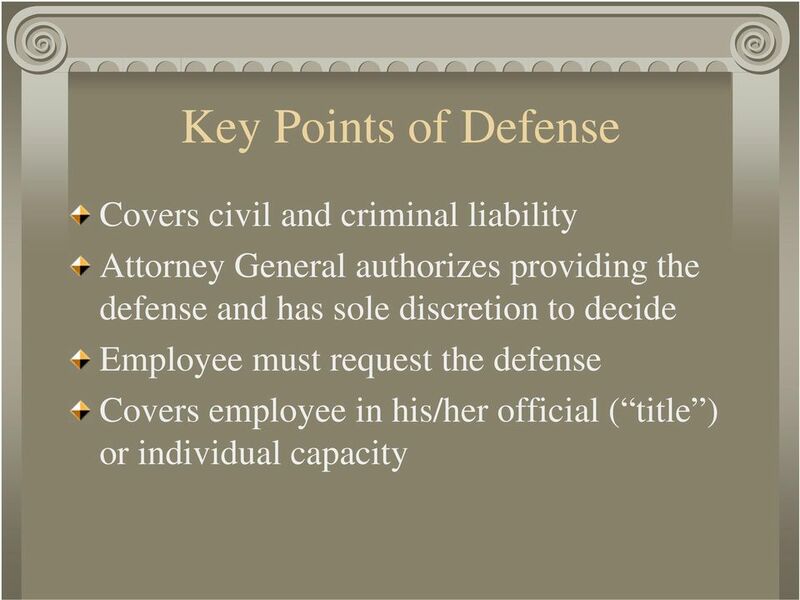 INSURANCE INDUSTRY PROFESSIONAL LIABILITY COVERAGE UNIT THIS IS A CLAIMS MADE POLICY. PLEASE READ CAREFULLY. 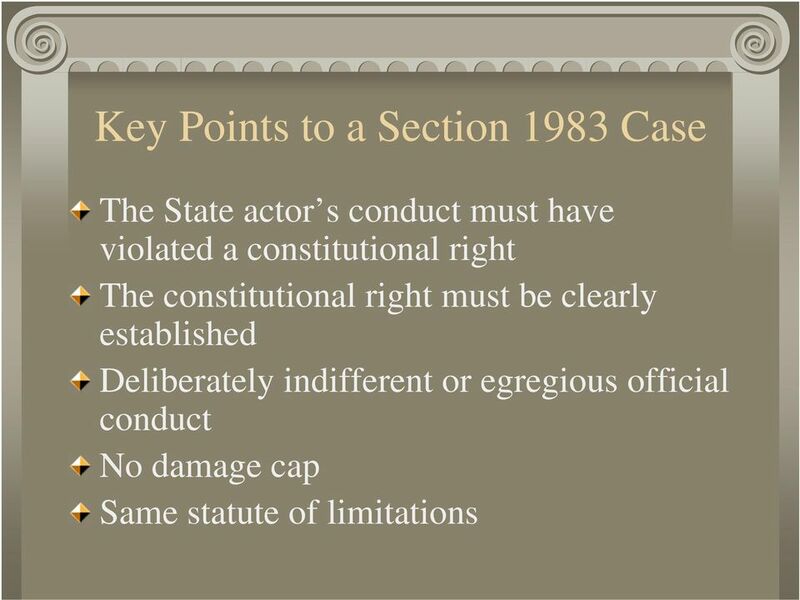 October 15, 1985 ATTORNEY GENERAL OPINION NO. 85-140. W. R. Brenner, M.D. Mayor, City of Larned P.O. Box 70, 417 Broadway Larned, Kansas 67550. 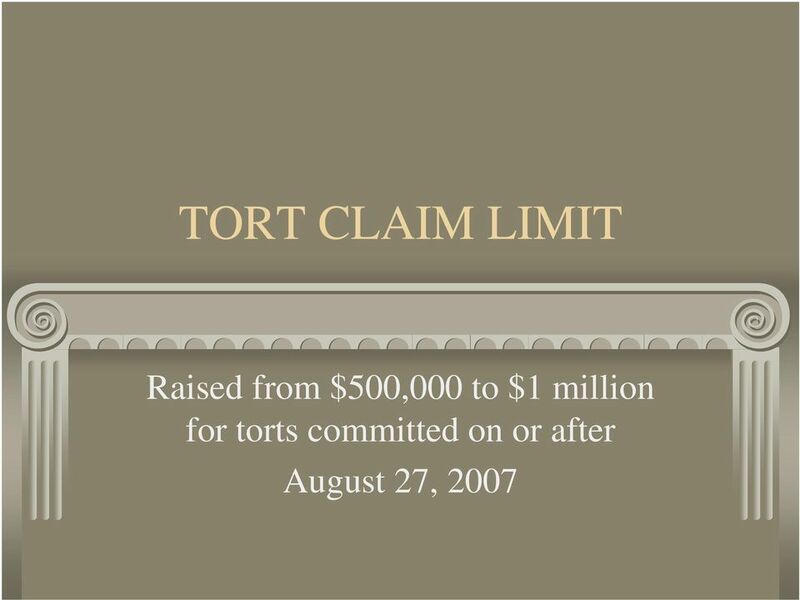 TEXAS TORT REFORMS Appeal Bond Reform: HB 4 (2003). 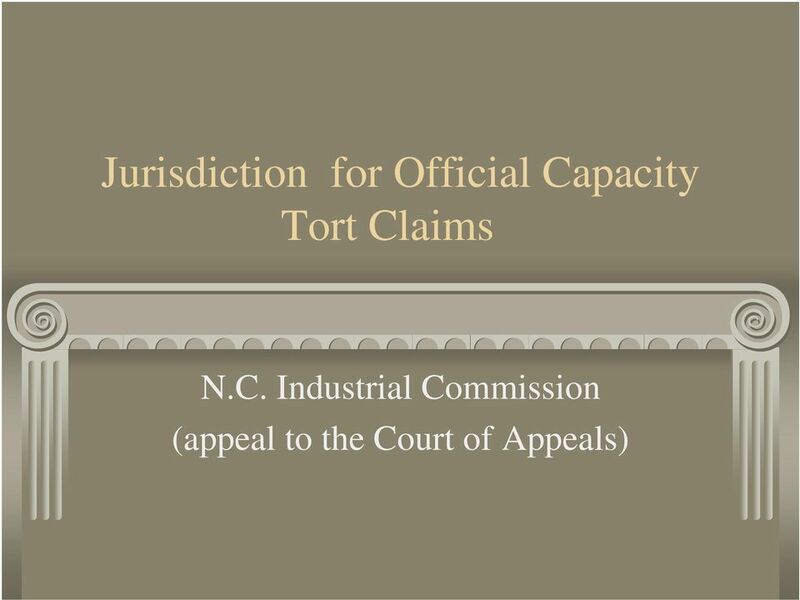 Asbestos/Silica Litigation Reform: SB 15 (2005). 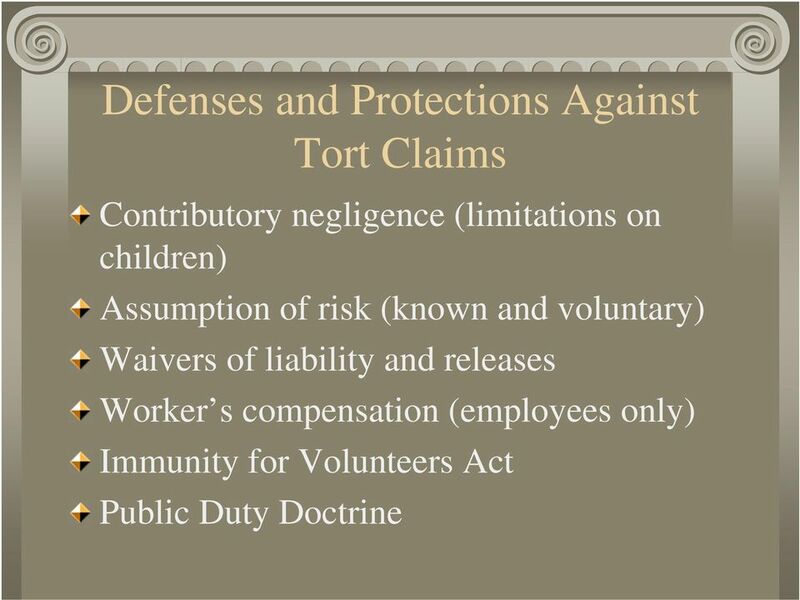 February 15, 2016 Professional Practice 544 Tort Law and Insurance Michael J. Hanahan Schiff Hardin LLP 233 S. Wacker, Ste. 6600 Chicago, IL 60606 312-258-5701 mhanahan@schiffhardin.com Schiff Hardin LLP. 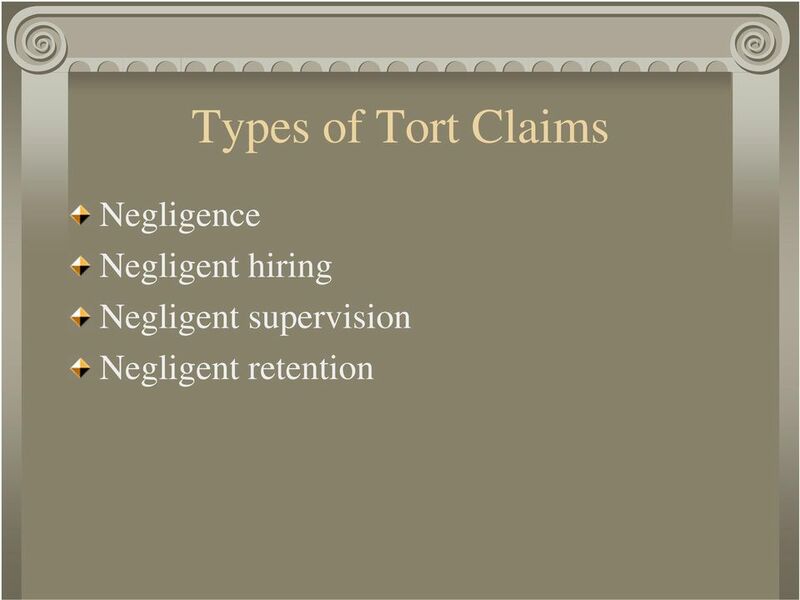 How Much Protection Does the Oregon Tort Claims Act Really Provide? 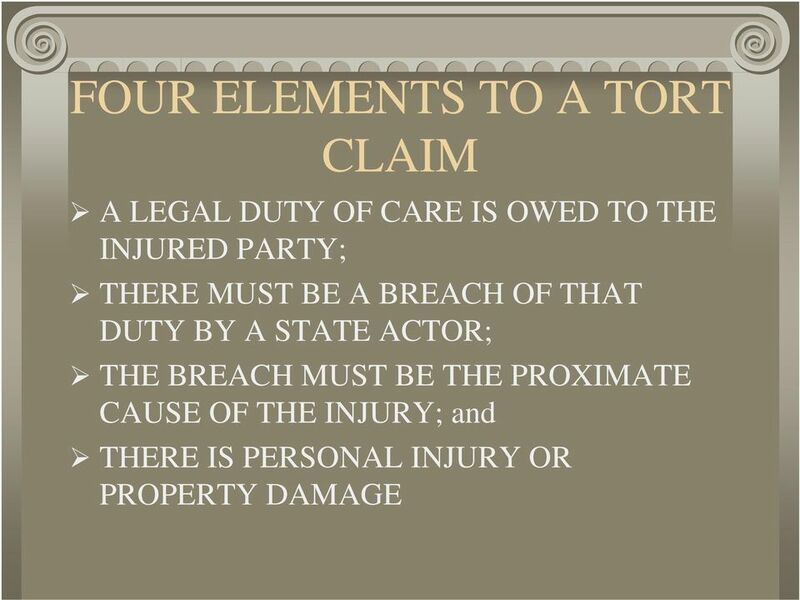 AUTOMOBILE LIABILITY & PHYSICAL DAMAGE COVERAGE AGREEMENT PART A GENERAL I. The TASB Risk Management Fund (Fund) provides coverage as outlined in this Automobile Liability & Physical Damage Coverage Agreement. 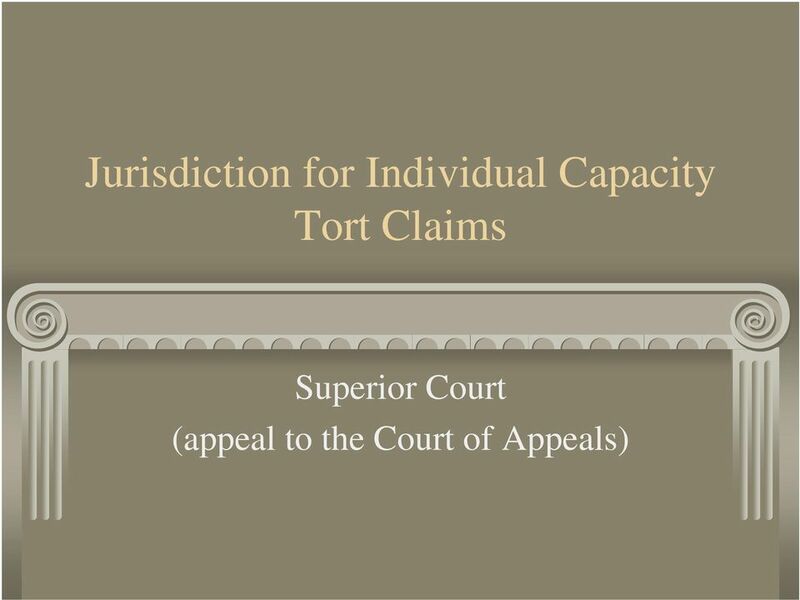 trial court and Court of Appeals found that the Plaintiff's case was barred by the statute of limitations. Duty of Care Kung Fu Instructor in Training Program Shaolin Guardian Network Negligence This civil wrong is most importance to all professional groups, as far as being a source of potential legal action.